The father of a first-grader at a public school in Ramat Hasharon filed a police complaint claiming his son was sexually assaulted before the Passover holiday by a janitor at the school. Police have launched an investigation into the allegations, while the janitor has been dismissed by the school. The alleged incident took place before the Passover vacation, and many parents of children who attend the school expressed their anger over the school principal's decision not to report the incident until the beginning of the week. According to what is know so far, the student told a classmate that the janitor offered him candy, and then led him to one of the rooms in the school, where he touched his body and kissed him. The classmate told her parents, who informed the boy's parents of the incident. A parent of a student who attends the school told Ynet that the principal "should not have tried to hide the incident from the parents. On the contrary, she should have informed us so we would be alert. What happened was a fiasco." The Education Ministry said the principal "acted appropriately and reported the alleged incident to a welfare officer, the police and the municipality as soon as she heard about it. Ministry guidelines do not obligate school management to inform all the parents of such incidents." Interior Minister Gideon Sa'ar arrived Tuesday in south Tel Aviv to examine firsthand the situation of African nationals in the area. "This is one of the most difficult, sensitive and charged issues Israeli society has to deal with," Sa'ar remarked. Israeli residents of neighborhood protested to the minister, with one calling: "People here are living in terror." Conversely, Baher Adam, a Sudanese refugee from Darfur, appealed to Sa'ar and said: "I'm a victim of persecution and violence in Darfur. I came here to seek asylum. I also care for the suffering of the Israeli residents of the neighborhood. We understand them. "But I didn't come here to hurt anyone; we just want our status to be recognized. When Darfur has peace and security, we'll return immediately," he told the minister. Adam further explained: "When a crime occurs in the neighborhood it's hard on us the same as it is on the residents. We refugees are also victims of violence. "What we and the residents really need is a regularization of the situation, because the two populations – residents and refugees – are under the custody of the Israeli government," the African migrant said. "We know what Gideon Sa'ar did for education and we hope he'll make a change here as well." "Yesterday was Holocaust Remembrance Day, but you must understand that we live here in a ghetto. The people who live here and I have no lives." Touring the accommodations of the residents and foreign nationals, Sa'ar remarked that "no one should live under these conditions." At the end of the tour the minister said, "The government's policy is to return the infiltrators to where they came from or to other countries. "This should be done according to the law and the values of the State. These are human beings." Sa'ar added: "The problem wasn't created in a day, and it's inadvisable to create an impression that it can be solved in a day. "The situation must be changed, and that's what I intend to do." 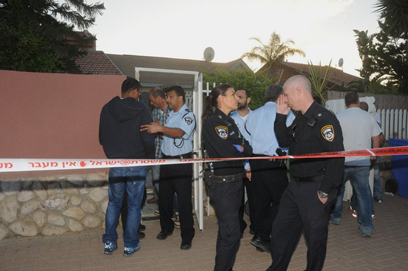 The body of a 74-year-old woman was found Tuesday evening at the entrance to her home in Beersheba's Nahal Ashan neighborhood. Signs of violence were found on the upper part of the body, as was a laceration in the throat area. Magen David Adom paramedics who arrived at the scene on Shmuel Rodensky Street pronounced the woman's death. At 5:39 pm police received a report of a suspected murder, and large Beersheba police forces, as well as criminal forensics lab technicians, were alerted to the scene. The woman lived in a private home near her family. 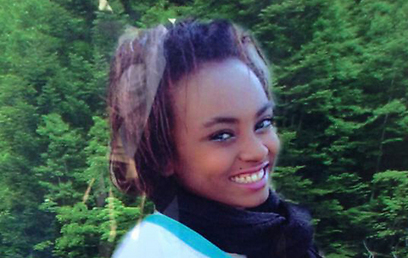 "Just yesterday I saw her and we spoke," a neighbor said. "Our street is fairly quiet. We've never had anything like this happen before." Major General Tomer Badash, commander of the Beersheba police station, said the circumstances of the woman's death remain unclear. 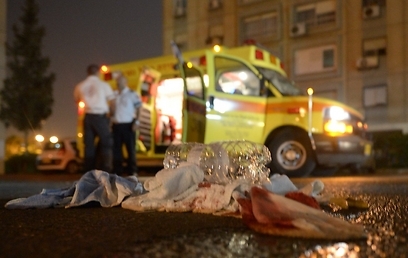 On Thursday a 45-year-old foreign worker from Moldova was murdered in an apartment on Sinai Street in Ashkelon. A 51-year-old security guard was arrested on suspicion of murdering the woman, who worked as his mother's caretaker. A day earlier 26-year-old Rehovot resident Yisrael Amar was shot to death on the city's main avenue. Another person sustained injuries to his leg in the shooting. The assailants fled the scene and are still at large. There have been sporadic reports of late suggesting that Hamas might rethink its principled stance of refusing to recognize Israel. The reelection of Khalid Mashaal as the chief of the movement's politburo may have created a certain impression that Hamas is opting for more pragmatism. Moreover, the United States has reiterated its refusal to talk with Hamas until Hamas recognizes Israel and ends armed resistance to the Israeli occupation. Such rumors are not being circulated in the media for the first time. In fact, we have been hearing such rumors for decades, effectively ever since the creation of the Islamist liberation group in 1987. The circulation of these rumors is not an innocent act, it is intended to create an impression that Hamas is walking in the same path that Fatah walked in when it recognized Israel and signed the hapless Oslo Accords 20 years ago. It is also meant to create confusion and discredit Hamas, especially after the Palestinian Islamist movement more or less succeeded in achieving a semblance of deterrence vis-à-vis Israel. The truth of the matter is that Hamas has not changed its mind about the basic issues of the Arab-Israeli conflict. 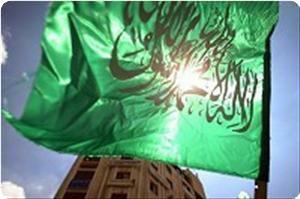 Hamas will not recognize Israel for religious reasons, first and foremost. For Hamas, recognizing Israel would be an instant and clarion political and moral suicide. In a nutshell, the bulk of Hamas supporters would abandon the movement and form a new organization in case Hamas recognized the Zionist regime. Recognizing Israel is no less than committing adultery with the Palestinian cause. It would make Hamas look a poor mimicry of Fatah, which would make customers opt for the original version, not the imitation. The PLO recognized Israel back in 1993, even without a reciprocal Israeli recognition of a Palestinian state. So what was the result? Did the Palestinians recover their rights? Did Israel allow for the creation of a viable Palestinian state? Did Israel stop Judaizing Jerusalem and come to terms with the right of return for millions of Palestinian refugees, uprooted from their ancestral homes at the hands of Zionist-Jewish invaders from Eastern Europe? The answers for these questions are clear to all and show that posing the very question of whether Hamas will recognize Israel is actually a red herring. Besides, why is the question directed to Hamas not to the myriad of Jewish political parties in Israel which don’t even recognize the very existence of the Palestinian people? Does the Bayt Yehudi (which is a coalition partner in the Netanyahu government) recognize the Palestinian people? Does Yisrael Betenu recognize the Palestinian national existence on its ancestral homeland? The answer for these entire questions is, of course, "NO." If so, then why doesn't the so-called honest broker, the U.S., refrain from exerting any pressure on Israel and only have a fixation on Hamas? Well, Hamas is not and will not be eager to talk to the Americans or even the Europeans. In the final analysis, the U.S. is part of the problem. After all it was thanks to America's unlimited and unrestricted support and backing of Israel that Israel has been able to spread its aggression and insolence all over the region. Indeed, it has been due to America's obsequious approach to Israel that Israel has been able to decapitate the two-state solution strategy altogether by building hundreds of Jewish-only colonies, inhabited by die-hard Talmudic-minded Jewish fanatics who believe that all non-Jews are beasts in a human shape whose lives have absolutely no sanctity. In fact, the United States would be utterly unable to force Israel to give up the stolen Arab land even if all Muslim countries and organizations were to unanimously recognize Israel. The U.S. is too subservient to Jewish pressure groups to grant itself the free will necessary to pursue a truly independent and honest foreign policy. Indeed, for the US to be able to play a truly constructive role in the task of Middle-East peace-making, the US must first free itself from the tight Israeli-Jewish stranglehold. As to the Europeans (the original sinners) they, too, could do very little. Haven't these hypocrites asked themselves who needs to recognize whom, Israel, the nuclear-armed state which also has the only super-power in this world at her beck and call, or the tormented and savaged Palestinians who have been languishing under history's longest military occupation? Hamas will not be striving to satisfy world powers for a certificate of good conduct, it is certainly not eager to be invited to the White House or to the European Union headquarters in Brussels in order to "join the civilized world," the very same world which superimposed Israel on Palestine, leading to history's grandest theft. It is the same civilized world which had murdered millions of innocent people and called the genocidal ethnic cleansing "manifest destiny." Hamas is not against Israel because Israel is Jewish. Any suggestion or allusion to that effect has no iota of truth. True followers of Moses have both historical and religious legitimacy in Islam. Hamas is against Israel because Israel happens to be murderer, thief and aggressor. Israel stole our homeland, murdered our people, destroyed our homes and villages, and dispersed us to the four winds. Are we supposed to recognize a state as such, based on terror, violence and war? Were the French asked to recognize the legitimacy of the Nazi occupation of their country? And now a last word. Israel has been negotiating with the PLO for two decades. The PLO carried out every conceivable Israeli demand, including torturing and even killing Palestinian activists on Israel's behalf. The PLO groveled at Israel's feet for too long and went to previously unimaginable extents to appease Israel. But Israel treated the PLO as a vanquished supplicant, not a peace partner. Hamas must not repeat the same experience under any circumstances, even at the expense of being viewed as a pariah by the U.S. In this hypocritical world, being viewed as a pariah should be considered an ultimate virtue, not a stigma. Israel's Justice Minister Tzipi Livni, who is also in charge of negotiations with the Palestinian Authority, is going behind Israel's Prime Minister Benjamin Netanyahu's back and expressing positions that undermine his conditions for negotiations, according to Maariv Israeli newspaper. Livni has shown willingness to retreat from Netanyahu's position, that in order for negotiations to begin, the Palestinian Authority (PA) must accept that Israel has a right to exist as the Jewish state. The newspaper quoted a Western source who is well-versed in the diplomatic contacts as saying that Livni "has become convinced that Israel's insistence on this condition could prevent the resumption of negotiations, and did not rule out the position presented to her, according to which the most Israel can receive from the Palestinian President Mahmoud Abbas is a recognition of the solution of two states for two peoples." 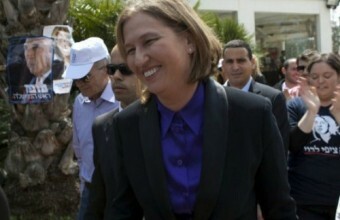 Maariv said that it has yet to receive Livni's reaction to the claim. 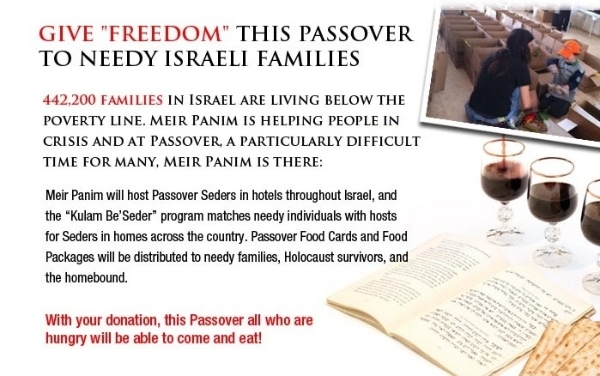 an Israeli organizations took advantage of the "Passover" Jewish Holiday to collect donations from the international community, based on statistics non-Jewish ethnic groups living in Israel. Meir Panim published on Haaretz english a campaign that calls the international community to donate to the poor families in Israel, stating that there are 442.200 families in Israel that are "Living Below the Poverty Line." This campaing was not promoted on the Haaretz hebrew page. While taking advantage of those numbers, the campaign stated that they are collecting money to feed Israeli families on "Passover". The campaign also mentioned feeding Holocaust survivors. Therefore the campaign is clearly collecting money targeted for Jewish Israelis, although taking advatnage of statisics that mostly include Arab Israelis, and other non-Jewish ethnicities living in Israel, such as Sudanese immigrant, post-soviet Chrsitians immigrants, druze, and a few other small minorities. This is not the first time such a campaign misleads it's donors. In the winter of 2012, another similar campaign wa being promoted, but then it was asking donation for shelters, clothes, and blankets for the poor Israeli families during the cold winter. US activist Rachel Corrie was killed by a moron Israeli soldier driving an earth-mover while protesting against the sickening and truly evil daily treatment of the Palestinians, but an Israeli judge has ruled that it was her own fault. Can anyone imagine an Israeli judge in an Israeli court ruling that it was the result of an Israeli killer when Israel has its fake 'We are the victims' image to cultivate while having one of the best-equipped armies on the planet and a massive nuclear weapons stockpile - courtesy of the American government (taxpayer)? This is the ludicrous man who is wheeled out to justify every Israeli atrocity against anyone. 'Israel can do no wrong, so it must be their own fault that they were obliterated by a bomb and that kid blown to bits by a tank shell was asking for it. He was a Palestinian after all. 'What happened was that the Palestinians made a psychic attack on the brave Israeli soldier when he was about to press the button to release flowers and balloons and this made his finger slip onto the launch button for bubble bath which we hoped would help to keep the Palestinians clean after we destroyed their water supply.